Need a better alternative to RescueAssist (formerly GoToAssist)? Splashtop SOS offers better pricing, faster performance, and the top features needed in an on-demand remote support solution. When comparing Splashtop SOS to RescueAssist, it’s easy to see why Splashtop is the best alternative . In fact, hundreds of former GoToAssist customers have already switched to Splashtop SOS and have not looked back since. Splashtop SOS is on-demand remote support software designed to help IT support and helpdesk teams provide ad-hoc remote support to their customers. SOS makes remote support simple for both the technician and the client. Plus, it is the best value remote support solution available today, saving customers hundreds, even thousands of dollars a year when compared to RescueAssist. By choosing Splashtop SOS over RescueAssist, you can save up to 70% off your yearly price. Both RescueAssist and Splashtop SOS are priced by concurrent technician. Today, RescueAssist’s yearly plan costs $660/year per concurrent technician. On the other hand, the basic Splashtop SOS package is only $199/year per concurrent technician. Splashtop SOS+10 and SOS Unlimited (which let you add unattended support to 10 or an unlimited number of computers) cost just $219/year and $399/year respectively. No matter which package you choose, Splashtop gives you the better deal. Either package you choose guarantees you save hundreds of dollars a year. Plus, with each additional concurrent technician you need, your savings with Splashtop will only get bigger. Not only will you save money, but you’ll actually get more top features with Splashtop! Every Splashtop SOS package includes the top tools requested by IT support and helpdesk professionals, including on-demand support to unlimited devices, connect with simple session code, screen sharing, file transfer, remote reboot, and more. Plus, you’ll also get features not found in RescueAssist such as support to iOS devices, multi monitor support, and remote print. Splashtop SOS is a top performing remote support tool thanks to Splashtop’s powerful remote access engine. You’ll be able to remote control your end-users’ Windows, Mac, iOS, and Android devices with ease, with HD connections in real time. Finally, you can rest assured knowing that Splashtop ensures secure remote access. All connections are protected with 256-bit AES and TLS encryption. You can learn more about Splashtop compliance with industry standards. Every week, several former RescueAssist customers switch to Splashtop SOS with great results. Hers’s a recap of the benefits of switching from GoToAssist to Splashtop SOS. You’ll save up to 70% on your price when compared to GoToAssist! You’ll get a high performance on-demand remote support solution. You’ll get the top tools and features needed to cover the demanding use cases of MSPs and IT professionals. Want to try out Splashtop SOS? 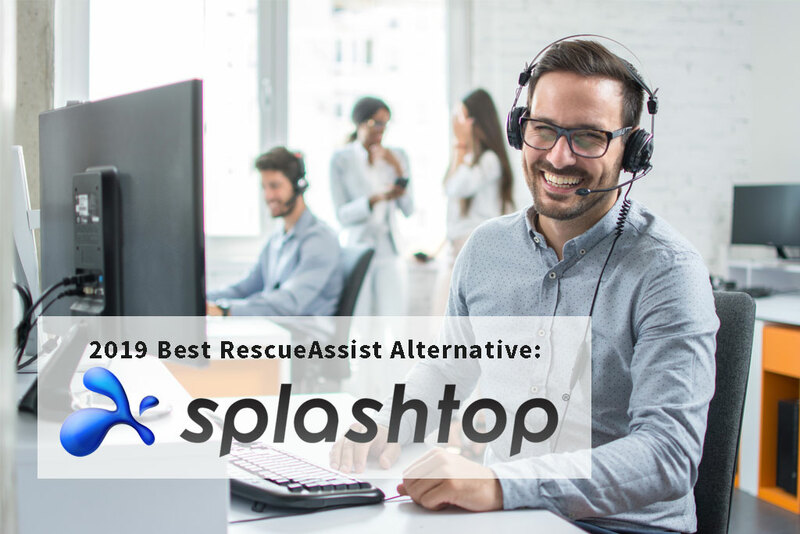 You can start a 7-day free trial now and find out for yourself why Splashtop is the best RescueAssist alternative. “Your system works much better than the one I had been using for many years, [RescueAssist]. Your sales and technical support people are very good to work with.” – George Wells. Interested in trying Splashtop SOS? Start your free trial today. Splashtop SOS – For MSPs, helpdesk, and service providers to provide attended/ad hoc support to clients.